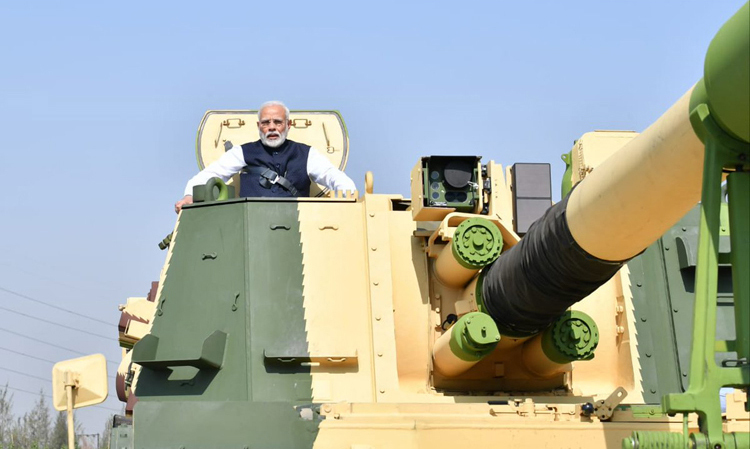 Demonstrating momentum to his Government's 'Make in India' agenda for military equipment, Prime Minister Narendra Modi on January 19 inaugurated India's first private sector facility for making tanks, armoured vehicles and artillery guns at Hazira in Gujarat. 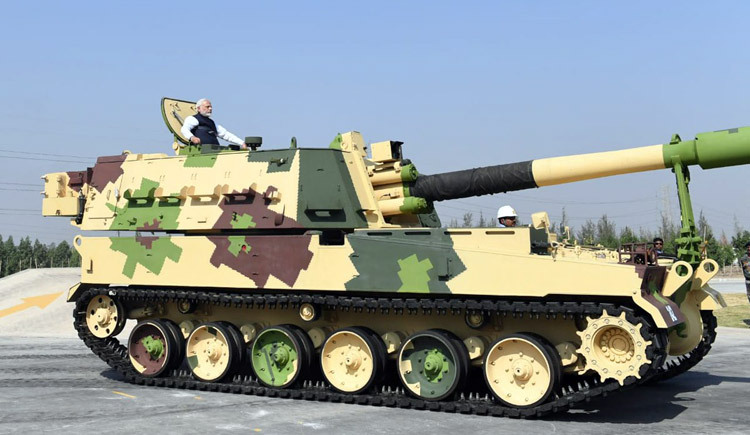 Larsen & Toubro's Armoured Systems Complex (ASC), in the course of its inauguration by the Prime Minister, showcased before him the K9 Vajra-T self-propelled tracked howitzer that it being manufactured there currently. One hundred of these 155 mm, 52 calibre artillery guns will be supplied to the Indian Army to give punch and mobility to its firepower along the borders in the deserts and the plains. Had the privilege of inaugurating the Larsen and Toubro Armoured Systems Complex in Hazira, Gujarat. "Boosting 'Make in India' in the Defence sector is our endeavour. I am glad that the private sector too is supporting this pursuit and making a valuable contribution," Modi tweeted after inaugurating the complex. "I congratulate the entire team of Larsen & Toubro for building the state-of-the-art K9 Vajra Self Propelled Howtizer. This is a significant contribution towards India's defence sector and protecting the country," he added. Defence Minister Nirmala Sitharaman was also present on the occasion at the complex, where L&T also famously manufactured the hulls for India's indigenous ballistic missile firing nuclear-powered Arihant class SSBN submarines at a neighbouring facility. The ASC is spread over 40 acres within L&T's 755-acre Hazira manufacturing complex. I congratulate the entire team of Larsen & Toubro for building the state-of-the-art K-9 Vajra Self Propelled Howitzer. "L&T has been supplying critical high technology equipment to the Indian Navy from Hazira and the ASC will now, in addition, address the needs of the Indian Army and friendly Nations to whom Govt of India promotes Defence Manufacturing Partnership,” said S. N. Subrahmanyan, the engineering giant's CEO and MD. The armoured facility is L&T's 10th manufacturing unit for Defence production, and its seventh raised over the past decade. 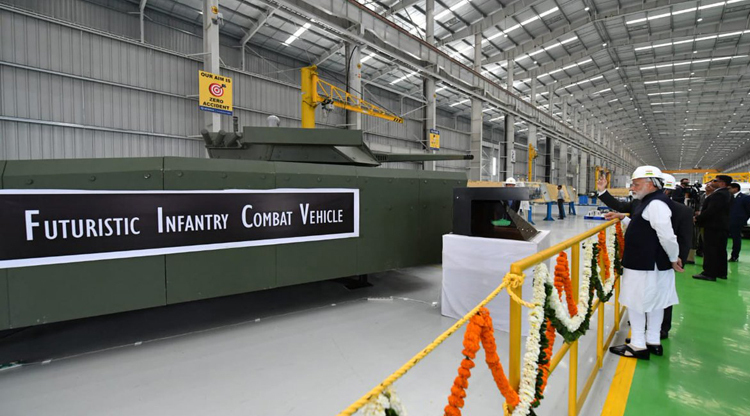 L&T describes its ASC as a state-of-the-art facility with a capability to make, besides artillery guns, futuristic tanks and armoured vehicles under the Army's Future Ready Combat Vehicles (FRCV) and Future Infantry Combat Vehicles (FICV) programmes. Besides high-end machinery and automation aids and feeder shops, it has full-fledged mobility Test Tracks for acceptance and qualification of armoured vehicles. The 4,366 crore contract for the K9 Vajra-T guns is the largest awarded to a private sector company by the Ministry of Defence. L&T, in partnership with South Korean Hanwha, was declared the winner in a global procurement competition for these guns. Hanhwa is providing key technologies for this gun programme. "The (K9-Vajra-T) programme embodies the spirit of the Government's Make in India initiative by large scale indigenous production of various equipment and systems for cost efficient through life support, through in-house development as well as transfer of technology, and judicious mix of L&T's in-house manufacturing facilities as well as multiple tiers supply chain. L&T Defence has played a catalyst's role in developing the ecosystem of partners mainly from the MSME sector," said J D Patil, L&T's Senior EVP (Defence). One hundred guns have been contracted to be delivered in 42 months, along with an associated engineering support package covering spares, documentation and training and Maintenance Transfer of Technology to the Army Base Workshop to support the K9-Vajra regiments throughout their life cycle. Having delivered the first 10 systems ahead of schedule, this complex is poised to deliver the balance 90 within the next 22 months. L&T is delivering these guns with 50 per cent indigenous content by value. The Make in India package involves local production of over 13,000 components per gun system through a supply chain of about 400 Tier 1 manufacturers, 100 of which are MSMEs. Fourteen critical sub-systems have been developed indigenously by L&T, including the Fire Control System, Direct Fire System, and the Ammunition Handling System. Auxiliary Power Packs, Air-conditioning Systems, Fire Fighting Systems, and NBC Protection Systems have also been developed in-house. L&T's Hazira Complex is among the few facilities in the world that produces extra-large offshore modules, reactor-end shields and steam generators for nuclear power plants, high-end equipment for the hydrocarbon, thermal power and Defence segments, as also ultra-clean special steels and heavy Forgings. At Hazira, L&T Defence manufactures submarine hulls and range of platform specific equipment and subsystems and special alloy forgings for Defence applications. At its Advanced Composites Facility in Ranoli, Gujarat, it makes critical composite sub systems for India's Space Launch Vehicles and sub systems for BrahMos and Akash missiles.